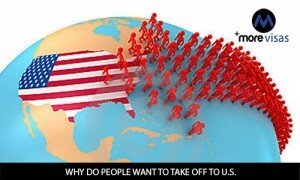 Home » USA Immigration » Why do people want to take off to the US? This entry was posted in USA Immigration and tagged immigration services USA US Citizenship US immigration services US Immigration Visa on August 5, 2016 by Blog Author. The United States of America is a great land of immigrants. Immigrant influx to this country increases every year. The world’s top economy is the favorite destination of many individuals who love to settle and work in US. 1. Numerous opportunities for both children and adults. Parents prefer to migrate as their children can benefit from the superior education system and plentiful jobs. 2. To get rid of oppression on religion, race, opinion or political reason. 3. To escape from the acts of violence or conflict. 4. Many people look for the superior healthcare of the United States. 5. Systematic legal procedures for all the immigrants. Despite numerous flaws, political uncertainty and economic ups and downs, the united States welcome legal immigrants on a large scale. Some 62 visa programs allow immigrants to enter the United States legally. In the year 2014… some 1, 016, 518 people migrated to the United States. ← Why is QSWP So Appealing?